As a Toronto wedding photographer I shoot weddings all over the GTA including Mississauga. Among all the wedding venues in the area, Mississauga Convention Centre is one of my favourites. Why do I like this wedding venue so much? First, this opulent looking establishment provides stunning backdrops that make my wedding pictures look gorgeous. Second, they provide excellent service and food, and I heard only good things about this Banquet Hall. Third, the Hall is conveniently located close to Highway 401 and 410 so we can jump on the highway to the nearest park for our bride and groom photo shoot. Even more important, the beautiful façade is a perfect background for day or night wedding photographs. Indoors, the lavish chandeliers adorning the hallway are elements of interest that add value to my wedding pictures. If that is not enough, the large hall can also be used as the ideal location for the first look and family photographs in the winter. That is exactly what we did at this Mississauga Convention Centre wedding. Last but not least, the Hall post beautiful reception rooms with high-tech gadgets able to create fog and even snow. Just imagine the high-quality imagery we can create in such location. The first dance is one of the crucial moments of a wedding at Mississauga Convention Centre or elsewhere. In this photo, the bride and groom are having their first dance while behind them, we can see the bridal party and the parents of the groom. 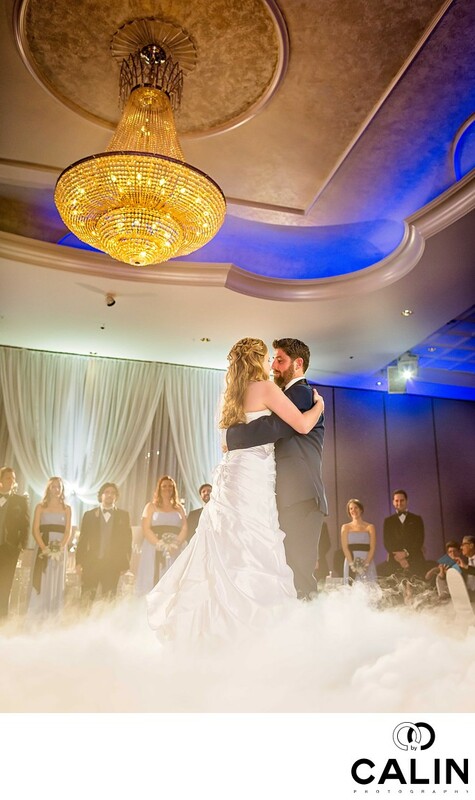 For this moment the DJ used dry ice to create smoke so that the bride and groom look as if they're dancing on a cloud. To capture not only the couple dancing and the guests but also the beautiful chandelier that adorns the ceiling, I laid on the floor and shot upwards. In this image, the bride and groom are placed on the right guideline according to the rule of thirds at the bottom of the frame. The chandelier is balancing them perfectly on the left side of the frame, placed along the left guideline on the rule of thirds grid. That also creates a diagonal consistent with the flow from the top left to the bottom right (the way we read). To photograph this image I used the 35mm 1.4 lens shut at F1.4 to capture the ambient light and to create separation between the couple and the background. Regarding lighting, this is a complicated scenario. First, there are two flashes behind the couple that gave them an edge light that separates them from the backdrop. Also, I used a video light to illuminate the couple. That is in addition to the lights provided by the establishment. In post processing the use dodging and burning to draw attention to the bride and groom. Also, I applied some basic skin retouching and skin softening. Finally, I enhanced the intensity of colours so that the blue lights on the ceiling are more visible to complement the orange tone of the chandelier in a classic colour scheme. Location: 75 Derry Rd W, Mississauga, ON L5W 1G3.